EMPTY SPACE: a review of "Passengers"
And the list of terrible movies from 2016 grows even larger. Dear readers, if there is anything that I cannot stand in Hollywood films is when the studios and filmmakers seemingly move mountains to ensure that the attractive leads they clearly paid oodles of money to obtain for their films remain likable within the film itself, even when it makes no narrative sense whatsoever. In the case of Director Morten Tyldum's "Passengers," we are inflicted with this cinematic crime to such an odiously disturbing and frankly, irredeemable degree that that movie itself should be stopped within its tracks completely instead of lumbering full speed ahead, as it wrestles a romantic explosion into fruition yet one that it has never fully earned by any iota. As I tend to announce to you from time to time, I see these things so you do not have to. Believe me, dear readers, I took this one for the team! 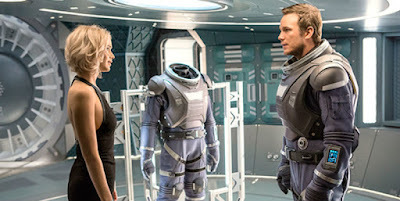 "Passengers" stars the likable and attractive Chris Pratt and Jennifer Lawrence as mechanical engineer Jim Parsons and writer Aurora Lane respectively as they voyage through the universe in hypersleep on the starship Avalon alongside 5000 travelers and 250 crew members from an over-populated Earth to the new colonization of Homestead II, a trip set to endure for 120 years. Yet, trouble strikes when both Jim and Aurora are awakened 90 years too soon, potentially dooming them both to die en route, making them eternal passengers, never reaching their intended destination unless they are able to discover why they were prematurely roused from induced hibernation and return to that state in the nick of time. And oh yes, no surprise at all, Jim and Aurora fall in love. Now, for all intents and purposes, there are aspects about Morten Tyldum's "Passengers" that are just fine. It is a sleek looking production, in that overly slick to the point of feeling plastic CGI where its "Jetsons" meets the space cruise ship from "Wall-E" (2008) aesthetics provide that Hollywood sheen to go along with some cute satirical nods regarding state of the art technology gradually failing basic human needs (honestly, you can send Earthlings all the way to colonize a new world but an electronic message takes 55 years to travel back and forth?). The film does zip along from start to finish but that may have more to do with the "and then this happened" quality of the narrative, which often made "Passengers" feel as if it were badly stitched together from various screenplay drafts and all in the purpose of ensuring those likable and attractive leads remain romantically linked regardless of...well, hang on, we'll get to that. Yes, Chris Pratt and Jennifer Lawrence, two actors (especially Lawrence) who I enjoy seeing, are more than likable and attractive enough and they do indeed build and share a strong chemistry within the film despite every plot contrivance thrown at them and man, are the two of them more than agile enough to twist their acting muscles into all manner of pretzel logic shapes to make a film this ridiculous, sloppy and for that matter, conceptually troubling, all but unravel. As you can see, I have been kind of dancing around a certain plot point contained in "Passengers" that for all intents and purposes should have stopped the film during the conception and forced the filmmakers to re-think and re-shape. Without explicitly revealing everything should you in case disregard my warning and see the film anyway, let's just say that one of the characters makes an...oh, shall we say...ethical decision that affects the other character's life entirely. Yet, because the studio wants for Pratt and Lawrence to remain likable and attractive to the audience at all times and therefore, fall in love, the script forces them to do just that when I would imagine in another film or if the scenario played out for real (of course, in the far, far future), the first character would have their head bashed in profusely and not in any way, shape or form be viewed as a tragic, romantic hero who was just lonely. Certainly and admittedly, everything that one can gather from the film's trailer does indeed make for an intriguing premise to shoulder a strong, entertaining science fiction themed popcorn thriller upon as it could serve simultaneously as an existential journey, a race against time adventure as well as that aforementioned love story. But as it stands...this one major plot point, the ethical dilemma at hand is so downright creepy and even predatory that for my tastes, it just stopped "Passengers" cold, and I really questioned why none of the principals involved with this project, from filmmakers to actors, ever stopped and thought to themselves, "You know..maybe this really isn't such a good idea." Or could it have been? Look...I just feel that if one is to make a film like "Passengers" and include this one specific and deeply disturbing plot point, then those involved should be ready to deal with the ramifications of such a plot point with more seriousness than Tyldum handles with the film as it exists: essentially on the level of a generic will-they/won't they romantic comedy with all manner of misunderstandings, revelations, pseudo heartbreak and Michael Sheen (who is fine) as the legless, android bartender/confidant who seemingly wandered into this movie from the set of Stanley Kubrick's "The Shining" (1980). IDEA #1: What if the character faced with the ethical dilemma actually wrestled with that decision and never met the second character at all, thus making the film essentially a solo affair, a survivalist story a la Robert Zemeckis' "Cast Away" (2000) or even Alfonso Cuaron's "Gravity" (2013), where the love story at hand could be between the first character and the second, who remains in hypersleep the entire time? I feel that this could give the film a deeply and achingly existential core pushing the film into a more esoteric arena exploring loneliness, mortality and love--perhaps a cross between something like Spike Jonze's "Her" (2013) and something from Terrence Malick? IDEA #2: Or skip the art with a capital "A," and just stay in the realm of the interstellar thriller. What if the film was entirely told from the perspective of the second character who slowly begins to realize what the first character has done, then making the film work as a survivalist story on two differing levels--perhaps something intensely claustrophobic like Ridley Scott's "Alien" (1979) merged with David Fincher's "Panic Room" (2002). And NO love story whatsoever! IDEA #3: Or have both characters in a survivalist story without that ethical dilemma at all, leaving any potential love story to be one that just doesn't have that nasty stalker element to it! Sometimes, the simplest ideas are the best. I do not know about you but for me, either on those ideas would feel to make for potentially much better films where both Chris Pratt and Jennifer Lawrence could be called upon to do more than just be likable and attractive and deliver some real performances that could swing for the fences, and exceedingly more than the good but middling work they are asked to do in "Passengers." To me, it just feels to be a shame to have Pratt and Lawrence waste time and energy trying to convince the audience of a love story that simply should not be, as it feels to be the result of not much more than a Stockholm Syndrome based male fantasy filled with false consequences and even worse redemptions that are designed to keep our two leads...once more with feeling.,..likable and attractive. But truth be told, all that I have mentioned are not the only problems abound within "Passengers," but most glaring is the whole problem of why cast terrific actors when you have nothing for them to do? For instance, why is Laurence Fishburne in the film at all, other than to literally pass on a plot point and also showcase again that Black people are unable to survive in space in the movies? (To Fishburne's credit, his reaction to his knowledge of the ethical dilemma is easily the film's BEST line of dialogue by a mile!) Even further, why did Andy Garcia receive a screen credit for showing up at the film's pre-ending credit conclusion, wholly unrecognizable and without a line of dialogue. I'm sorry, but Morton Tyldum's "Passengers" is not exciting, not profound, nor epic or emotionally sweeping and for the love of Pete, it is nowhere near anything resembling something romantic. Aside from being crass, messy and more than a little stupid, it is a film that is so dangerously afraid of any risk taking and too concerned that we still are so enamored with the two likable and attractive leads that it undercuts any sense of good storytelling from end to end. Look, I will concede that there is something to the idea of a "Last Man On Earth"/"Adam & Eve In Space" conceit that could be played with and explored to great effect. 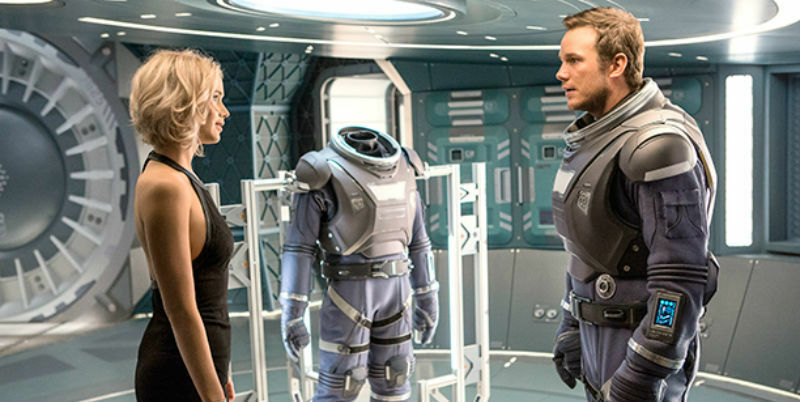 Unfortunately, not one of those potential ideas were utilized in "Passengers." WHEN WE FOUGHT AND HOW WE LOST: a review of "Divided We Fall"
"You can't wait for the leadership to catch up to the people." This film very nearly brought me to tears. Tears of anger, disappointment, and profound sadness, and entirely due to the sheer potential of all that could have been. The year 2017 will mark my 30th anniversary as being a resident of my adopted city and state of Madison, Wisconsin. I arrived here at the age of 18 as a college Freshman at the University Of Wisconsin-Madison, graduated in 1991 and have since made my life and family here in this beautiful city, a location that has consistently spoken to and enriched my spirit to degrees that I would never fully be able to recount to you. In February of 2011, when Governor Scott Walker first released his so-called "Budget Repair Bill," known forever as Act 10, his initial shot at the dismantling of Wisconsin, I found myself compelled to join my fellow Madisonians and Wisconsinites overall in the protests designed to stop this destructive bill from coming to pass. I joined the protests somewhat early on, yet after the State Capitol building was fully occupied by protesters. As with my love for Madison itself, I am simply unable to fully express to you the seismic emotional impact I felt during that extremely intense, undeniably angry but also, powerfully extraordinary time. Twice a week, for weeks upon weeks and soon months upon months, I stood side by side with all manner of people aligned in solidarity and protest. I met so many different people from within state and soon from out of state of various ages, races, genders, economic classes, and so on and despite the fear of the unknown, I felt a tremendous uplift and after a time, the weight of the historical impact that was occurring right in front of my eyes. I documented the experience through hundreds of photos and countless conversations. I signed petitions. I stood and walked in the bitter cold weather around and around the Capitol. in addition to traveling thorough the entirety of the building, often standing directly in the epicenter of the Capitol Rotunda, cheering, playing in a drum circle, uncharacteristically speaking myself hoarse on the "People's Mic" and listening to others perform the same. The sheer power unleashed during that time felt as if it would shake the sky and as the crowds ballooned upwards of 200,000 people, the mythical moral arc of the universe felt as if it would bend in the direction of justice and fairness by the force of good will that was happening all around me. And after all of the speeches and signs, the music and the messages, the solidarity and camaraderie, all presented with a fever pitched urgency, Act 10 was passed anyway. Scott Walker avoided being re-called anyway and furthermore, he was re-elected as Governor for a second full term despite all of the broken promises, factual evidence of his failed policies and even the criminality of himself and his inner circle due to a John Doe investigation. Every tactic of protest, every inspiring moment contained in what is now known as the "Wisconsin Uprising" was trampled with such painful finality, that even now, as we live within a President Trump America, with all manner of protests consistently occurring across the country, I question whether if there even remains any point, as the obstacles feel more insurmountable and the past defeats were indeed so crushing. To screen a feature film documentary about the massive initial waves of the Wisconsin Uprising, especially having played a tiny role within it first-hand, was not the sort of thing that I was necessarily anxious to re-live. Frankly, I can see the results of that time each and every day, just by still living in Madison and working a few short blocks from the Capitol, so cinematic reminders of 2011 and the hopes for what could have been are truly unnecessary for me. That being said, "Divided We Fall," is a stunning, sobering documentary from Writer/Director Katherine M. Acosta, and proved itself to be a riveting, compulsively watchable experience. Yes, as previously stated, viewing the overall failures of this specific protest movement nearly brought me to tears but even so, I could easily tap back into those awesome emotions I felt from 2011 quite easily, as the passion and commitment of so many people truly felt as if it could move mountains. Even while feeling discouraged, the importance of speaking truth to power, peacefully and by whatever means necessary, remains crucial to maintaining any sense of democracy. Acosta's film is extremely wise to this conceit but even wiser when it showcases the mistakes, the pitfalls, and the ways progressives and liberals can be apt to become lost in the weeds of their own making, as well as how agendas can clash even when working on the same ideological sides. As a document of the recent past, and as a simultaneous warning as to how we approach the nature of protest and resistance in a Trump America, "Divided We Fall" makes for difficult and unblinking yet gripping and ultimately, essential viewing. With the deeply rooted resentment of benefits received by state and public employees within some Wisconsin communities presented as our contentious historical backdrop, Katherine M. Acosta's "Divided We Fall" opens with Governor Scott Walker's first political victory in office with his signing of the 2011 Act 10 bill, which consisted, among other items, the stripping of collective bargaining rights of state and public employee unions. Additionally, Acosta gives us a front row seat to ominous, chilling footage, obtained by filmmaker Brad Lichtenstein, of Scott Walker callously expressing to billionaire donor Diane Hendricks that he would easily be able to transform Wisconsin from a Blue to Red State via his self-described "first step" of "divide and conquer" politics contained within the aforementioned Act 10 bill, which was introduced on February 11, 2011. From here, and over the course of 90 briskly presented yet meticulously detailed minutes, Acosta's "Divided We Fall" chronicles the origins of the Wisconsin Uprising protest movement, which began innocently enough with a UW-Madison Teaching Assistants Association Valentine's Day protest march, complete with a collection of valentines to be delivered to Walker's desk, and how it rapidly ballooned into a full blown occupation of the State Capitol for seventeen days, a protest which was further compounded by the 14 senators fled the state to stall the crucial Budget Repair bill vote, therefore temporarily stopping Act 10 in its tracks. Even with all of the first hand knowledge I gained from my time at the protests, Acosta consistently delivered information and perspectives that I otherwise would never had known. I found it deeply fascinating how the Capitol occupation began so organically and so swiftly, suggesting that this was a movement that was indeed just waiting to happen. 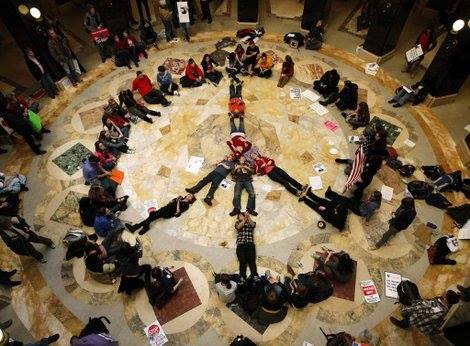 In fact, the occupation itself was never even designed to be anything more than what one of the interview subjects referred to as a "sleepover," an almost quietly passionate stall tactic that was supposed to last for one night to just allow public testimonies against Act 10 to continue into the morning when the Union representatives would arrive and possibly take the reins. Truth be told, when I was spending my time experiencing and documenting the protests, the historical impact of what was occurring really didn't dawn upon me until I was deeply ensconced, many, many visits later. For so many of the participants who actually organized and did essentially live within the Capitol during that period, I gathered the strong feeling that many of Acosta's primary interview subjects in "Divided We Fall" may have held similar feelings regarding any role they played that could be construed as "historical." Yes, Acosta does include moments and individuals from when our state-wide struggle became national and even global, with images of filmmaker Michael Moore and former MSNBC host Ed Schultz's visits to our state making the cut in this film. But, Acosta very smartly never slides her subject matter into any sense of celebrity. She elicits a razor sharp focus upon the common, everyday Wisconsin individuals who found it within themselves to rise to this unprecedented occasion, and in doing so, all of them (in my opinion) became Civil Rights heroes in the process, for solely the reason that their tenacity and steadfast nature created and enforced a presence that was representative of so many people within Wisconsin, who by the nature of their respective lives, would simply not be able to make the exact same physical commitment as the occupiers. Because the occupiers were there, so were we all. Within "Divided We Fall," I deeply appreciated Katherine M. Acosta' presentation of the Capitol occupation itself, as it was the first media representation that I have seen that I felt correctly presented the sights I experienced week after week first hand, a representation that was consistently misrepresented or misreported--from the intentions of the protesters, to the cleanliness of the Capitol, the overall temperament to even the sheer numbers of the protests at their highest--by the local media. In that respect, Acosta's film powerfully corrects a variety of serious wrongs, allowing viewers to really see the protesters as they truly were. People who were not interested in causing damage and destruction or instilling a sense of political and societal mayhem. While emotions were undeniably intense, the nature of the protests were doggedly peaceful and feverishly respectful to all individuals and the environment of the Capitol itself, viewpoints and images that Acosta shares over and again throughout the film. And frankly, I do feel the need to list several of these individuals, Acosta's interview subjects, as their efforts were indispensable to the longevity of the Capitol occupation. and the late Marty Beil, AFSCME Council 24 Executive Director 1985-2015, who was led out of the Capitol in handcuffs, a profoundly sorrowful ending to a mighty career. All of those individuals present themselves in the film with an open, honest professionalism and candor that was indicative of the masses who took part within the protests, and Acosta delivers them all to the viewer without any manufactured hyperbole, forced melodrama or feigned heroism. For all of the invigorating protest footage, Katherine M. Acosta's "Divided We Fall," succeeds greatly not just as a document of a specific socio-political time period. As previously stated, the film serves as a template combined with an urgently solemn warning for the mistakes to be avoided now that we are not only living in a two-term winning Scott Walker Wisconsin but more grandly, a President Trump America. What made Acosta's film so shattering, and without utilizing any sense of political dogma, she not only demonstrated precisely how rebellions can rise and fall but how the politics of self-preservation, especially from those who are fighting upon the same political sides, can negatively affect and ultimately derail the movement. In the case of the events depicted within "Divided We Fall," we have Union leaders, the Democratic Party of Wisconsin and the Capitol protesters all with differing agendas and no means of consolidating a variety of messages and approaches into something unified. The local Madison Teachers Inc. organization felt betrayed by the union of Wisconsin Education Association Council, essentially losing whatever foothold the protesters may have obtained initially. Protesters felt abandoned by Wisconsin Assembly Democrats, who seemed to favor a certain status quo at the expense of innovation. And Acosta captures one infuriating moment late in the film featuring former Wisconsin Assembly Democrat Brett Hulsey took to the "People's Mic" during a stage when Walker's Department Of Administration increased a state police presence designed to move the protesters out of the Capitol and announced to the crowd, "We are winning! We are winning! And one of the things winners do is they know when to...uh...you know...you know...when to back off just a little bit." Hulsey's condescension, his own misconceptions about the occupation, even alleging violence that never happened, was deplorable and indicative of the lack of solidarity that ran against the words of solidarity people like him spoke of. Furthermore, Acosta gives us the trepidation and uncertainty of the protesters themselves, people forced to police themselves to the point that they felt unsure as to how far they should fight this battle. The defeat of the protests and the uprising in full was profound in its symbolism as Madison, Wisconsin was the birthplace of progressive politics and now, under the Walker regime, those politics have effectively been killed here, thus setting the table for the national wave to enact the very same policies under the Trump presidency. With the Republicans, it can be expected for them to lie, cheat and steal their way into power and unapologetically so--and in the case of the events during and after the uprising in 2011, the Republicans handled themselves with an unprecedented degree of rapacious disregard for any political decency. That being said, the Democrats and the Union leaders made the grave error of placing all of their political eggs in the recall Scott Walker basket, thus forcing everyone to again trust in a specific system that had already let so many down--precisely the stage where liberals and progressives find themselves in 2017, and with a new Wisconsin Governor's election set for 2018 with no clear opponents to Walker in sight. Divide and conquer indeed. Katherine M. Acosta's "Divided We Fall" is truly remarkable work. After two viewings, and with a myriad of narratives at her disposal to chose from, it amazes me how Acosta kept her film from being bogged down and cluttered, ensuring that her presentation contained a clean, clear-eyed focus that always kept her cinematic eyes upon the prize. Her film is emotional, certainly. Informational, definitely. But it is first and foremost an impassioned piece of journalism merged with a history lesson designed for understanding how to proceed with our political battles in the future by regarding the triumphs and most importantly, the missteps of our recent past. WOLVERINE'S FINAL HOWL: a review of "Logan"
Based upon the Marvel Comics character Wolverine created by Roy Thomas, Len Wein & John Romita Sr. I am not, and have never been, a fan of the "X-Men" film series. It may be a surprise for you to read those words from me, but yes, it is true. After the messy, miserable third film, Director Brett Ratner's "X-Men: The Last Stand" (2006), I had given up entirely, and even then, I had been tremendously underwhelmed by Director Bryan Singer's initial two installments, "X-Men" (2000) and "X2: X-Men United" (2003). For me, my disappointment was found in the fact that "The Uncanny X-Men" was my favorite comic book series for a very long period of time as I was growing up. The series, at that time under the brilliant leadership of Writer Chris Claremont and Illustrator John Byrne, presented a multi-cultural group of characters I latched onto more than any others I had previously read, as the stories of the X-Men contained so much more than punching, kicking , and colorful costumes. These were poignant, powerfully emotional and often tragic tales that compelled me to read and re-read and even after much convincing, my parents even allowed for me to have a subscription to the series--something I never held for any other comic within my life. For me, the films just felt wrong, from how the characters were presented and acted to their motivations.and how they were handled overall. For my perceptions, and despite Singer's obvious passion for the characters, the film series felt to be somewhat uninterested in building a complete universe that was true to the source material and simply just making a showcase for what was clearly the most popular character of the comics, the brutal Wolverine, the enraged Canadian adorned with the skeleton made of adamantium and those homicidal retractable claws, nearly all of the other characters be damned. To be more than fair, Hugh Jackman, perfectly embodied the role of the iconic character in turbulent tone and roaring spirit if not in actual size (remember, comic book Wolverine is about 5 ft tall and Jackman is over 6 ft), and his towering presence has indeed been a focal point for the film series without question. I just wished that the movies had worked for me in the same way the actual comics had. So, at this time we arrive with Director James Mangold's "Logan," the third and final entry in the solo Wolverine film series and tenth "X-Men" themed film overall. Truth be told, I have not been waiting for this film in the least, for all that I have previously mentioned plus my comic book movie fatigue of which I have shared my views about on this site over and again and I will spare you the repetitiveness now. But, as you can see, I did find myself in the movie theater to screen this film anyway, as the glowing reviews did indeed make me curious enough to wonder if this time we would be in store for a different experience. My curiosity paid off and them some as "Logan" is a superior send-off for the character as well as a brutally effective thriller decidedly made for adults due to its more than deserved and unprecedented R rating (more on that later). It is a film that contains more than enough punishing action to be sure, but "Logan" reaches its power due to the careful construction and execution of its characters and story, always remembering that without those two crucial elements, we would be left with nothing but mindless carnage. "Logan" possesses anything but as this is a film with grit, fury and soul. Opening in the year 2029, "Logan" again stars Hugh Jackman in the titular role but now at an especially advanced age, with his body being slowly poisoned by his adamantium bones, his retractable claws functioning a tad slower, his self-healing powers weakening and all the while nursing a hefty alcoholism and an existential despair as he faces his inner demons concerning the violence he has inflicted as well as his impending mortality. From the world of the Tranisgen corporation emerges three crucial figures. First, is Pierce (Boyd Holbrook), the cybernetically enhanced chief of security and head of his gang of enforcers known as The Reavers, who initially offers Logan a job but who ultimately conducts a feverish hunt for our former X-Man. Secondly, we meet Gabrielle (Elizabeth Rodriguez), a Transigen nurse and potential whistleblower who urges Logan to protect and deliver our third figure, Laura (Dafne Keen), an 11 year old mute who bears the exact same adamantium skeleton, healing powers and deadly claws as Logan, to North Dakota and a sanctuary known as "Eden." 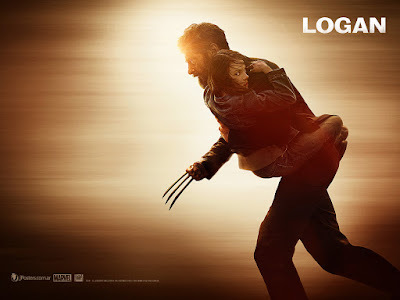 While reluctantly carrying Laura in tow, Logan goes on the run, hopefully evading his tormentors and his inner demons while he, at last, comes to the fullest of terms with his abilities and the decades of violence and carnage that he has inflicted, regardless of any righteousness to his causes. Unlike any of the other films within the "X-Men" film series, James Mangold's "Logan" is an especially grueling entry. While the film offers no shortage of special effects, action, adventure and fight sequences (which are all richly choreographed and executed with teeth gnashing ferocity) surprisingly, the film never succumbs to what Hugh Jackman himself referred to as the "CGI arms race," where digital bombast and cataclysm rule the day at the expense of characters and story. On the contrary, Mangold simultaneously honors yet escapes from all of the comic book movie genre trappings by serving up a firmly grounded and unmistakably grave installment, where not only characters and story are front and center, the film's darkly humane and poignant power fuels its "dying against the light" narrative to a stirring and sobering effect and starring familiar yet much older and considerably damaged characters wrestling with the choices and consequences of their respective pasts as impending mortality looms largely. This aspect of gravity within a comic book themed film is a rarity indeed and I deeply appreciated to tonal changes and quality, certainly emboldened by the film's tricky R rating. Yes dear readers, we do have a hard R rated film on our hands and for any of you who happen to be parents of small or younger children (teenagers will be just fine) who have seen the previous films within the series, I strongly urge you to NOT take your children to "Logan" as this film contains more than its fair share of grisly, graphic bloody violence plus copious adult language filled with profanities to go along with the considerably adult themes of mortality. That being said, nothing contained within "Logan" felt to be remotely gratuitous as Mangold ensured that every action sequence possessed its own fight or flight rage that is inherent to the character of Logan and the urgent, rampaging threads of this story. In fact, what James Mangold has delivered with "Logan" is much less of a comic book film and something more in line with a road movie or a modern day Western, a deeply effective tone that is enhanced strongly through the gorgeous dusty, sun soaked, autumnal cinematography from John Mathieson. As I watched "Logan," certainly thoughts of Sergio Leone came to mind, as did Clint Eastwood's "Unforgiven" (1992). And Director George Stevens' "Shane" (1953) is referenced heavily throughout. Beyond those touchstones, Mangold has taken the colorful world of superheroes and has crafted in its place something that feels of the same universe as television's "Kung Fu" (1972-1975) and films like Quentin Tarantino's "Kill Bill: Volume 2" (2004), and definitely Jeff Nichols' excellent "Midnight Special" (2016). Yet, for my money, "Logan" felt closest to the barren post-apocalyptic landscape of George Miller's "The Road Warrior" (1981) and "Mad Max Beyond Thunderdome" (1985) as the relationship between Logan and Laura reminded me considerably of situations presented with Max's relationship with The Feral Kid from the former and his dealings with the desert children in the latter. But rest assured, I am not expressing the sentiment that "Logan" is a new film made from the spare parts of past motion pictures. I just found a dark, kindred spirit within Mangold's film. One where fantasy is seriously underplayed in favor of a greater realism, pain and uncompromising tragedy . After 17 full years of portraying the character, Hugh Jackman has somehow pulled out all of the stops as never before in the titular role and he has miraculously unearthed some new notes to enhance, inform and transform this beloved character that we have known and followed for so very long. Jackman delivers a rich performance of unrepentant existential rage and sorrow, displaying a pummeling physicality to mirror the psychological anguish.Yes, this film marks Hugh Jackman's final turn at the role but his performance in full is so captivating, that it feels as if it is the final performance he will ever give...period! Both Patrick Stewart and Stephen Merchant perform beautifully alongside Jackman and Boyd Holbrook makes for a terrific, relentless villain. But young Dafne Keen as Laura is absolutely sensational!! To have this young individual convey an enormous amount of history, fear, wrath, and an anguish that is equal to Jackman's and also with a searing physicality, Keen truly looks and feels as if she is an uncaged wild animal trapped and forced to survive in a world not of her making. She is compulsively watchable and riveting to behold in a performance that is positively seething. 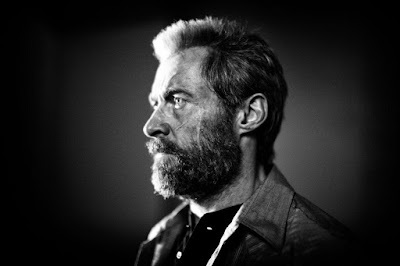 I think the finest thing that I am able to say about "Logan" is that it is the rare comic book themed film that actually goes well beyond the extra mile to re-envision all we know about the genre and ultimately make something that extends and challenges precisely what a comic book themed film can actually be. What James Mangold has achieved is a film that is far better than it ever had any right to be as "Logan" will stick tightly to your cinematic ribs, deeply and completely satisfying as well as existing as a reminder that films of this nature need not only be blandly disposable or even well crafted pieces of entertainment. That a comic book themed film can aspire to ascend to being a work of art, like what Christopher Nolan achieved with "The Dark Knight Trilogy" (2005/2008/2012) and even Sam Mendes' extraordinary James Bond outing with "Skyfall" (2012). With "Logan," James Mangold has created a film of true existential outrage that begins as a rampage, concludes with the most delicate and undeniably earned grace note and leaves us all beautifully shaken and stirred with amazement. STAY WOKE: a review of "Get Out"
Late in the evening on November 4, 2008, I discovered that the America in my head was real. It was the night that Barack Obama was elected President of the United States, making him the first President of African-American descent in the nation's history. As I watched the celebration in my home town of Chicago's massive Grant Park upon the television, with the sea of faces of different ethnicities, ages, and walks of life all banded together harmoniously, I felt the tenor of the world shift its moral arc towards what felt to be a greater justice and even some sense of evolution. That being said, I was no fool lost in dreams of utopia for that kind of harmonic convergence could never arrive so easily or even that completely. For the news anchors on that night, the term "post racial" was bandied about, as if the fact that a Black man had been elected President, racism itself had been unquestionably and entirely vanquished. Upon hearing that term, I laughed to myself and said out loud to no one in particular, "Post-racial?! You kidding? It's just gonna get worse." Never could I have ever imagined just how much worse it would become over the following eight years for President Obama and by extension, for all Black people due to the endless disrespect, obstructionism and flat out hatred from a Congress who clearly did not ever wish to work with him, and a right wing/corporate media who endlessly vilified him, all for the purpose of delegitimizing his Presidency. To that end, that vitriolic quality which flowed into and eventually emboldened his detractors within the American population took hold and grew into a more openly vocalized racism which has exploded into violence, and the continued murders of unarmed Black people by police and others. From here birthed the Black Lives Matter movement as well as revealed a certain indifference to the point of erasure, and even intolerance, by sections of White communities, media figures, politicians and leaders ("All Lives Matter" anyone?). And so, now in the 21st century, even after eight years of having a twice elected Black President, Black people again, and still, are forced to profess and proclaim our equal humanity to a world that seemingly could not care even less, even when we are shot in the back and left to die in the streets and the killing is captured in full on a cell phone video. Dear readers, I felt the need to open this review in this fashion because, oddly enough, I am absolutely ecstatic! After enduring the underwhelming cinematic year of 2016, 2017, on the other hand, has begun with a bang. Beginning with the resurgence of M. Night Shyamalan with his terrific thriller "Split," I now arrive at "Get Out," the debut feature film from Jordan Peele, one half of the comedic duo of Key & Peele, and what an outstanding, superbly unsettling and provocatively audacious filmmaking debut it is. As many of you may already know, and also as you can gather from the title, "Get Out" is indeed a horror film, but it is one that has tremendously more on its mind than simple jump scares, gross out effects and graphic violence. What Jordan Peele has miraculously conceived is the brilliant merging of the horror genre with the psychological thriller and most importantly, a scathing social commentary and satire that delves straight under the skin and deeply into the turbulent heart of the persistent paranoia and fear that sits in the pit of Black life in America, and increasingly so in a so-called "post racial"/post Obama/current President Trump America. It is a wonderment to me that something of this type has not really been achieved to this level before now. But NOW is indeed the time and Jordan Peele is the one who has somehow cracked a certain inexplicable code and for my money, "Get Out," the second film of 2017 that I have seen, is already one of the best films of 2017! "Get Out" stars Daniel Kaluuya as Chris Washington, an African American Brooklyn based photographer who is in an inter-racial relationship with his White girlfriend, Rose Armitage (Allison Williams), and the couple are planning to take a weekend trip to her parents estate where he and her parents can meet for the first time. Seeing as Chris is Rose's first Black boyfriend, he is uneasy with the prospect that her parents are unaware of his race, a feeling of unease that Rose bats away as she explains that her parents are not the least bit racist and even moreso, if possible, they woud have voted for Obama for a third term. Upon arriving at the estate, and meeting Rose's parents, the neurosurgeon Dean Armitage (Bradley Whitford), and psychiatrist/hypno-therapist Missy Armitage (Catherine Keener), Chris formulates a trepidacious relationship, as the parents' slyly unctuous acceptance of him plus the increasingly sinister smiles of their White neighbors and the forced behaviors of the estates two Black employees, a groundskeeper (Marcus Henderson) and Georgina the maid (an absolutely chilling Betty Gabriel), all create a growing anxiety that he keeps bottled up in favor of his relationship with Rose. As the racial undertones continue to arise, therefore increasing Chris overall paranoia over slights that may or may not be real or imagined, "Get Out" soon delves into a horrifying darkness from which there just may be no escape. In a promotional interview leading up to the release of "Django Unchained" (2012), that film's Writer/Director Quentin Tarantino expressed to public radio host Terry Gross that he felt that genre or even exploitation films that tackled topical issues tended to ultimately be more emotionally truthful than prestige or historically based films because some films of intended prestige tended to keep the audience at arms length from the drama, as well as being overly concerned with a certain level of good taste, which also dilutes the drama and tension. In the case of "Get Out," in conception and full presentation, Jordan Peele has made an exceptionally effective, enormously entertaining and often ingenious horror film. I do realize that I was being purposefully cagey with the plot description but that is solely because I wish for you to experience the film with as little information as possible, of course. Now, with that in mind, please note that I am not a connoisseur of horror films, so in doing a tad of research for this posting, I discovered that there actually have been some films to utilize race as a subtext within the genre, most notably a film like George A. Romero's "Night Of The Living Dead" (1968) which I actually have never seen. Yet, for "Get Out," the topic of race is no mere subtext. 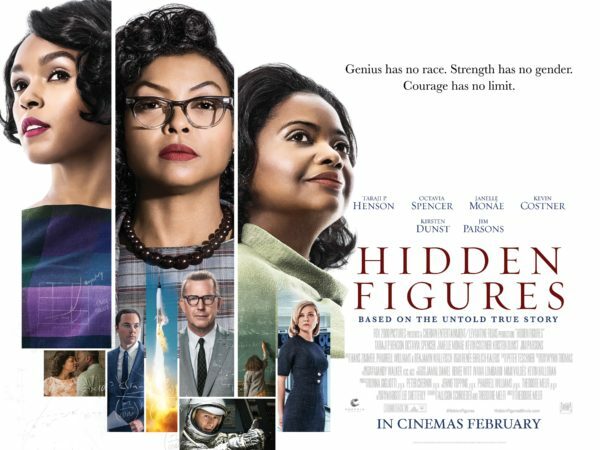 Race and racism is front and center, making it a film unlike anything that I have ever seen before, even while Peele smartly weaves in elements as experienced in television's "Twilight Zone" and films like Tobe Hooper's "The Texas Chainsaw Massacre" (1974), Bryan Forbes "The Stepford Wives" (1975), Stanley Kubrick's "The Shining" (1980) and it even made me think a little bit about Kevin Smith's "Tusk" (2014) as well. While I could never truly know, I cannot help but to wonder if Jordan Peele's "Get Out" was in any way inspired by the classic Eddie Murphy comedy routine in which he stated that Hollywood is unable to make horror films with black casts because we, as Black people, would just know better than to remain where we clearly are not wanted, the punchline of which featured Murphy using a ghostly voice extolling the words, "GET OUT!" to which his hapless, everyman homeowner would turn to his wife and quickly say, "Too bad we can't stay." To that end, Jordan Peele's "Get Out" is that Eddie Murphy routine made into a full length feature in which he upholds Murphy's critique while also disproving it, Peele has effectively satirized horror films in which Black characters are often the first to get slaughtered while also honoring Black audiences who have been so consistently loyal to the horror genre just by having a Black male in the leading role. As perfectly conceived, the character of Chris Washington is one, who at all times, behaves in a fashion that you would believe someone in his situation would behave--especially those of us in the audience that happen to be Black. Therefore, this sense of realism and gravity completely undercuts any and all situations where audience members would give themselves over to yelling at the movie screen due to the stupid things characters always tend to do in horror films. In fact, everything is contained within the film's title. Why doesn't Chris just get out of the Armitage estate to begin with? Well, that is where Peele's satirical and painful commentary finds its realism and force, always ensuring that Chris does not get into and out of situations just because the script says so and otherwise there would not be a movie. On the contrary, his situation--initially--mirrors situations Black people, including myself, have found ourselves in more times than we are willing to count., which ultimately creates a certain paranoia that is a sad, simple constant of being Black in America. Peele advances the horror of his film brilliantly by first establishing the realities of being a Black face within a predominantly White place, even when surrounded by White individuals who proclaim themselves to be liberal, thus eliciting a precarious sense of security while inadvertently or even directly making remarks and assumptions that are indeed filled with prejudices. Certainly, not the sort of exchanges we wish to expect from people who "mean well." Just take the film's initial meeting between Chris and Rose's parents. Yes, Dean mentions that he would've voted for Obama for a third term but he also insinuates ways to somehow drop the word "boy" into the conversation on a couple of occasions, as well as some "my man" and "thang" colloquialisms, to which all Chris is able to do is to just grin and bear it for the sake of his relationship with Rose. A later sequence when Chris is essentially on display for the White community during the annual Armitage get-together (in many ways, a sequence that extends from and is more surreal than the brilliant "Juneteenth" episode of Donald Glover's excellent television series "Atlanta"), he is still forced to endure all manner of offensive questions and comments, again for the sake of his relationship and to also not fall into the stereotype of the angry Black man or one who is seemingly "looking" for racism. If Chris were to basically "get out" at this point would possibly upend whatever standing he holds with Rose and her family, despite his own well being and even sanity. By remaining, Chris is an unwilling specimen is what Peele has effectively and eerily displayed as nothing less than a 21st century slave auction. And even then, there is the matter of Chris' inability to forge connections with the groundskeeper and Georgina the maid. their increasingly unsettling behaviors and mannerisms notwithstanding, all of which are more reasons for Chris' paranoia to mount to the point where he is forced to even question his own sanity regarding his hosts' intentions--a paranoia which brilliantly mirrors comedian's W. Kamau Bell's blistering "How Do You Know It Was Racist?"routine. Because of the film's perspective, "Get Out" feels like natural extension of the stinging, teeth baring satire of Writer/Director Justin Simien's "Dear White People" (2014) as well as the aforementioned Donald Glover's "Atlanta," while also existing as a feature which is wholly original in our current cinematic landscape of sequels, prequels, reboots and so on. 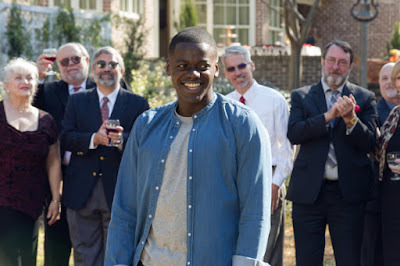 But the sheer inventiveness and astuteness of "Get Out" never wavers once the film flies into its final third, when everything is revealed, the impending dread of the story threatens to engulf Chris and all of us in the audience and the action itself turns especially grisly. Peele never takes his eye off of the prize so to speak as he utilizes his film to continue to play into and upend stereotypes as he has taken the everyday Black American nightmares and wrapped them up inside of an even greater Black American nightmare where themes of White envy and privilege, battles of racial supremacy, cultural appropriation, enslavement, a ferociously inventive take upon the old "Oreo" stereotype, fears and fury regarding Black male/White female relationships and a Final Solution scenario that leads to the eventual eradication of one race in favor of another are all on display and performed with sheer brilliance, skill, confidence, tension and a level of moral outrage and catharsis that I really haven't felt since "Django Unchained." And even further, somewhat surprisingly for a film this intense, "Get Out" contains a hefty amount of laugh out loud humor and much credit must be delivered to the mighty presence of Lil Rey Howery as Chris' best friend, the TSA agent Rod Williams, who serves as the film's much appreciated comic relief, from commenting upon the action as well as serving as anon-screen representative of the audience screaming at the movie itself. I can tell you that every time he appeared upon screen, it was most welcome due to his terrifically engaging presence plus my need to take a breath from the terror. What is actually more frightening to Black people? Overtly racist figures like the KKK, neo-Nazi skinheads and the like or would it be the liberal elite, those who feel that they themselves could not be capable of any sense of racism or hold any prejudices whatsoever? For myself, they both frighten me! But, the deeper emotional hurt and the pain would arrive from those who would thrust an "All Lives Matter" at me as I would ultimately feel not only misunderstood, but disregarded in addition to being disenfranchised, and my own rightful sense of humanity would be abandoned in favor of their own sense of self-preservation. Jordan Peele's "Get Out" is perfectly in tune with that specific sense of cultural fear and isolation, and I applaud him for tackling this reality with honest and unmerciful creativity. I just wanted to add that I saw "Get Out" coincidentally on the 5th anniversary of Trayvon Martin's murder. When his murderer George Zimmerman was later found "not guilty"on July 13, 2013, I found myself afraid more than I have ever been in my life as I realized that "open season" had just been declared upon Black people. All of the murders, especially those captured on camera, that have occurred since Trayvon Martin, plus the repeals of gun access restrictions, relaxations of gun laws, the rise of Conceal and Carry laws and now White supremacists in the White House have all felt like a slow moving genocide to me, only intensifying my own paranoia, which has only grown since I have gotten older. Growing up, I attended predominantly White schools for much of my life. I currently live in a predominantly White city. And I have worked for predominantly White businesses. And like the character of Chris Washington, I have found myself stifling myself so as to not rock the boat, as it were. I have found myself in truly wrenching professional situations with supervisors where my race was clearly the unspoken element in the room yet like Chris Washington, I questioned my own sanity as if my paranoia could not have been justified. My wife is White and like Chris Washington, I too feared meeting her parents all of those years ago when we first began dating--and to varying degrees, both of her parents (now both deceased) accepted me without issue. Her older brother on the other hand...well, it's just not worth going into as I will most likely never see him again. All of my personal situations, emotions and experiences rose to the top while watching Jordan Peele's "Get Out," hence the length of this review as Peele, again, ingeniously places us all in the shoes of a young Black man, giving everyone the opportunity to view the world through is eyes while also serving a story that honestly works you over triumphantly. This is really Jordan Peele's first film?! Good Lord, after this I can't wait to see what he comes up with next!! Each month upon Savage Cinema I share with you my plans and schemes for the month, revealing which films I hope to see and review for you and myself. Now that the Oscar season is behind us (CONGRATULATIONS "MOONLIGHT"!!! ), and my review of Jordan Peele's "Get Out" is on deck, I honestly have no idea of what my plans and schemes may ultimately happen to be. Honestly, your guess is as good as mine. Perhaps I would try out "Logan," the 10th film in the "X-Men" series, a franchise I abandoned long ago after the third film which I just loathed. But, the reviews for this new film have been exceedingly high, so that plus its more adult R rated tone, has intrigued me. Yet, even so, I am not sure if I necessarily want to dive back into that pool. Or would I finally check out the recently Oscar nominated, box office smash "Hidden Figures"? To be a part of the conversation, plus receive a window into a world of history that I never knew about, I do need to see this film. 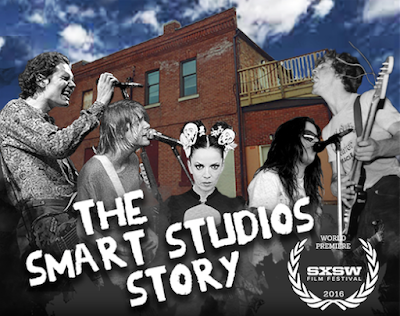 And then, there are several music based documentaries that I have piled up here at home, including "The Smart Studios Story," a film not only important to the Madison, WI music community but to music itself, Oddly enough, I do not tend to have much time at home to just leisurely watch a movie due to my schedule but I have been itching to watch this film since first heard of its creation. So...we'll see what the month brings and until then, I'll see you when the house lights go down!